Remember the old Highlights Magazine we use to read as kids? I remember spending hours looking for the hidden objects scattered throughout the magazine. 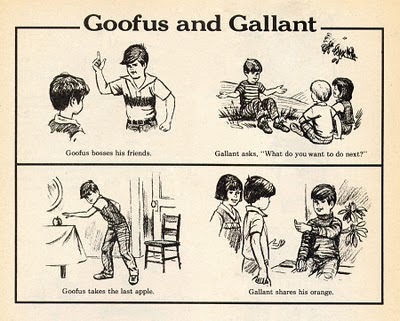 I also remember the Goofus and Gallant comics. They were two polar opposite characters meant to teach the children reading about right and wrong. I used to love reading them but must admit I fell more on the Goofus side of things as a kid. Having been involved in youth ministry for over a dozen years, in one way or another, I’ve noticed that we still have those Goofus and Gallant kids sitting in our chairs and it got me thinking about the expectations we have for them. Often, youth workers want contradictory things from their students – docile, “Gallant”-like manners along with extraordinary feats of intellectual, creative, or physical stature. But the extraordinary talents actually arise from the “Goofus” side of each student’s personality. As youth workers it’s essential that we learn to see those intense, often irksome traits as the seeds of your student’s greatness, possibly even their God-given giftedness. Your stubborn or whining student as persistent. Your complaining student as discerning. Your argumentative student as forthright and outspoken. Your loud student as exuberant. Your shy student as cautious and modest. Your reckless, accident-prone, or rule-breaking student as daring, risk-taking, and adventurous. Your bossy student as commanding and authoritative. Your picky, nervous, obsessive student as serious and detail-oriented. Too often we only see what lies on the surface of each student and often the problematic behaviors and attitudes are misdirected strengths and giftedness. Maybe if we only see the negative in our students it’s because we haven’t provided a more appropriate, kingdom-minded outlet for them to direct their energy and passion towards. Goofus would always take advantage of any opportunity that presented itself in the comic strip. How useful might that skill and attitude be if it were redirected towards God’s purposes? Me too Drew. I’ve noticed that kids seem to act according to the expectations I have of them and if I expect them to act “goofy” then goofy is usually what I get. When I first started homeschooling my oldest daughter, 6-years ago, we made a poster while reading through the book of Proverbs comparing the Wise Gallant to the Foolish Goofus. And, while it is true that we both sometimes identified with the Foolish Goofus, the intent of the project was to grow in Wisdom. Oh, and my behind the scenes goal was to teach her that her behaviors have affect on people outside of herself.